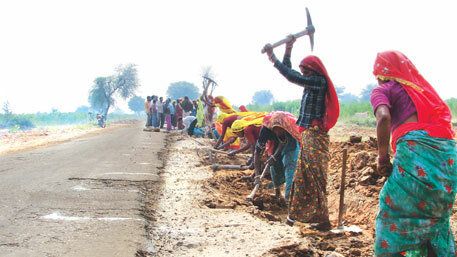 WITH most of its recent schemes struggling, a desperate UPA government is pinning its hopes on Mahatma Gandhi National Rural Employment Guarantee Scheme (MGNREGS) to win votes in 2014 elections. The government is overhauling the employment scheme that helped it return to power in 2009 for a reason. It touches the lives of over 55 per cent of rural voters in the country, which the UPA thinks, might compensate for the anti-incumbency drive against it. 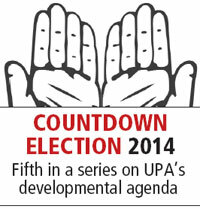 Experts, however, feel it may be a case of too little, too late for the UPA with the elections round the corner. Union Ministry of Rural Development initiated a series of steps between November and December 2013 to increase the demand of works and the outreach of the employment scheme. Through these steps, the ministry has tried to plug the basic problem of people not enrolling under the scheme. There has been a consistent dip in the number of people applying to work under MGNREGS primarily because of delays in payments and lack of awareness. The employment programme is a demand driven scheme that guarantees at least 100 days of job in a year. The average working days generated under the scheme in the country last year was 36. The average was 54 days in 2009-10. During the winter session of Parliament in last December, Union Rural Development Minister Jairam Ramesh introduced a penalty on officials who failed to pay the workers within 15 days. He also assured Rs 10,000 to all job card holders under the programme for constructing toilets. Earlier, there was an incentive of just Rs 4,500 for the same. The government also notified on December 9 that MGNREGS workers who were employed for at least 50 days in the previous financial year are eligible to benefit from the Building and other Construction Workers Act. Under this Act, over 20 million households will be eligible for insurance schemes Aam Aadmi Bima Yojana (AABY) and Rashtriya Swasthya Bima Yojana (RSBY), receive Rs 5,000 assistance for purchasing tools every third year, get training for upgradation of skill and 15 days maternity benefits. There is also a provision for food basket worth Rs 200 per month for the aged and widows and a loan up to Rs 1 lakh for constructing houses. AABY is a social security scheme for rural households that provides monetary benefits of up to Rs 75,000 if the head of a family meets with an accident that renders him disabled or dead. Under RSBY, a below poverty line family gets health insurance coverage of up to Rs 30,000. The government has also announced a nationwide campaign called Kaam Mango Abhiyan (KMA) from February 2. A pilot project of the campaign was started on November 18 in six districts where the rural ministry, along with state and district administrations, MGNREGS workers and civil society organisations, are trying to attract more people to the scheme. The six districts are Sitapur (Uttar Pradesh), Katihar (Bihar), Nashik (Maharashtra), West Singhbum (Jharkhand), Sundergarh (Odisha) and Raichur (Karnataka). The campaign will reach out to gram panchayats to give people an opportunity to register their demand for MGNREGS work. It also plans to change the frequency of Rozgar Diwas from once a year to every month. Rozgar Diwas is observed under MGNREGS once a year when people get to directly speak with officials about their grievances. MGNREGS’ 55 per cent outreach in rural voters is higher than all the welfare schemes of the government, except Food Security Act. India has 725 million voters, out of which 510 million lie in villages. 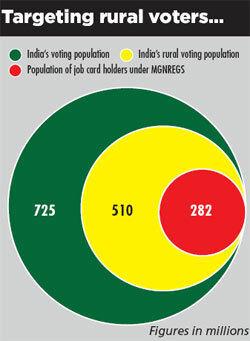 Over 282 milllion rural voters have job cards under MGNREGS. The data of 2009 National Election Study (NES), conducted by Center for the Study of Developing Society (CSDS) in Delhi, suggests social programmes like MGNREGS, loan waiver schemes and other played a crucial role in swinging more than two per cent votes in favour of UPA in the 2009 general elections. The government is hopeful as the pilot project of KMA has been received well. In its first month, it generated 252,670 demand for MGNREGS work applications and collected 52,471 applications of job cards. The success of the campaign can be gauged from the fact that in Katihar alone, it generated over 52,000 demands and received 23,000 job card applications. UPA in its second term has launched a slew of welfare schemes, but almost all of them have either got delayed or have landed in trouble. The National Food Security Act, which guaranteed grains to 67 per cent of the population at cheap rate, was crafted by the government to have a higher outreach than MGNREGS. But delays have marred the project. Delhi was the first state to roll out this Act five months before its December Assembly election. But, the Congress faced a humiliating defeat in the state elections. Even the direct benefit transfer scheme (cash transfer scheme), which Finance Minister P Chidambaram termed as “game changer” during its launch, has turned into a nightmare after it was marred with glitches (see ‘Lost in Transition’, June 16-30, 2013, Down to Earth). As a result, despite launching the pilot project of the scheme in Rajasthan, the Congress government lost in the Assembly elections in December. The two other major social welfare Acts under UPA II—the Right to Fair Compensation and Transparency in Land Acquisition, Rehabilitation and Resettlement Act, 2013 (LARRB), and the Right to Education Act 2009 (RTE)—have limited coverage among voters. LARRB, which replaced an archaic land acquisition Act, was implemented on January 1, 2014. With elections four months away, it is not expected to yield much electoral benefit. RTE is also not expected to bring voters as education has never been an important poll issue. Another important legislation of UPA-I is the Forest Rights Act 2006. The problem with the Act is that it recognises the rights of forest dwellers, who constitute a small proportion of total vote shares. Also, tribal votes are traditionally shared among several political parties. Not just political parties, but even MGNREGS supporters say the recent changes to the scheme might not help UPA. “All these efforts do little to help Congress,” says Sanjay Singh, political scientist with CSDS and national coordinator of NES 2009. “It can help if other factors are constant with 2009. At present, the Congress has nothing it can take to the public,” adds Singh. An official from the rural development ministry admits MGNREGS stopped working sooner than expected due to poor implementation. “While it helped UPA in 2009, it should look at other options this time,” says the official. Experts also say that the recent initiatives do not offer anything new. “The campaign is just recording demands made by the people, documenting their grievances and offering participatory redressal on Rozgar Diwas. This was already ingrained in the scheme but was not in practice,” says Ashish Ranjan of Jan Jagaran Shakti Sangathan of Bihar. Reetika Khera, a development economist, says, “It is a fact that MGNREGS is in bad shape and needs some impetus for revival. But the scheme would hardly increase the support base of UPA in four months,” she says. BJP spokesperson Prakash Javdekar says, “People have already rejected the Congress in the recent Assembly elections. Their revival plan of MGNREGS would fall flat in Parliament election in face of price rise.” He adds whatever the Congress does now would be just promises as they cannot be rolled out before the elections. While experts believe the changes to MGNREGS will have little impact on the poll outcome, it remains to be seen if UPA is able to deliver on its promises.